Since adult pond smelt feed mainly on zooplankton, they may be important competitors with young sockeye salmon. The pond smelt is a small fish up to 8 inches in total length. It is distinguished from other Alaska smelts by its small mouth, the two rows of minute, brush-like teeth on the vomer and palatines bones, and the number of mid-lateral scales, between 51 and 62. The adipose fin of the pond smelt is typically longer than the diameter of the eye which distinguishes it from surf smelt. The mouth of the pond smelt is equipped with moderately developed canine-like teeth, which are lost as the fish approaches maturity, so by spawning time it usually has no teeth at all. Pond smelt are generally light brown to olive green above, with a metallic silver band along middle of sides. Ventral regions are silver shite in color with pale fins. Males are easily distinguished from the females during spawning by the tubercles on the head, scales, and fin-rays. Pond smelt are anadromous which means it lives part of its life in the ocean and part of its life in fresh water. Pond smelt spawn in fresh water streams, lakes, or ponds. Pond smelt do not strictly "home" to a particular water body like salmon, but appear to use streams or ponds in the general area where they were spawned that have the best habitat conditions. Spawning sites are located along shallow river shores and in backwaters with little or no current, often in lakes, on sand or gravel. Eggs are "broadcast" over pebbly gravel bottoms in streams or ponds but often in littoral areas of ponds where the bottom is covered with organic debris. Like most species of smelt, fertilized eggs are initially demersal and sticky, adhering to whatever they touch. The eggs hatch in freshwater in 11 to 24 days, depending on the water temperature. After emerging from the eggs, young pond smelt migrate downstream to salt water to grow to maturity in the sea. After two to three years at sea, they return as adults to spawn. After spawning, the majority of pond smelt die. River currents carry newly hatched young to the sea where they feed mainly on rotifers and other plankton. As juveniles and adults they feed mainly on zooplankton such as copepods, cladocera, insects, and occasionally algae. Since stream water temperature can affect the timing of the spawning migration, the numbers of spawning pond smelt returning to a particular stream can vary greatly from year to year depending on stream water conditions and overall ocean survival. Some streams can have two separate but overlapping migrations. In Alaska, pond smelt are seasonally abundant in Beauford Sea drainages and south along Bering Sea coastal regions to the Copper River, Northern Gulf of Alaska. 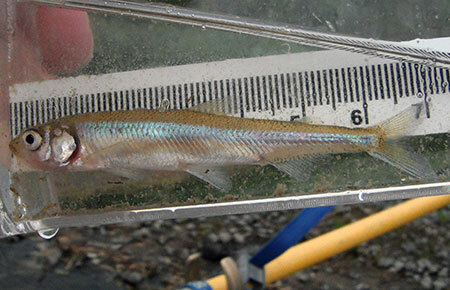 Population discreteness for pond smelt within and among river systems in Alaska is unknown, as very little information exists on pond smelt in general. It is clear that an understanding of pond smelt genetic population structure is necessary to identify appropriate management units for maintenance of biodiversity and productivity. Overall strength of pond smelt returns vary across the state by year and location. Why run strength remains strong in some areas while weak in other areas is unclear. Potential overharvest from commercial, personal use or subsistence fisheries is the main threat to the resource. The pond smelt is a small fish up to 8 inches in total length. 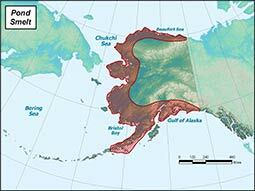 Beauford Sea drainages and south along Bering Sea coastal regions to the Copper River, Northern Gulf of Alaska. Zooplankton such as rotifers, copepods, cladocera, insects, and occasionally algae. Salmon, sharks, sturgeon, sea lions, seals, humpback and beluga whales, seabirds, eagles, ravens, crows, salmonids, and bears. Female pond smelt can produce up to 4,000 eggs and anadromous pond smelt typically die after spawning.